When Green Lantern recites his oath, he promises to do his best. He practices self-control and uses his power ring only when necessary. He is diligent and perseveres in his fight against villains like Star Sapphire and Sinestro. Green Lantern is responsible! 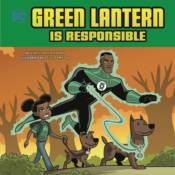 Learn more about Green Lantern's sense of responsibility in this exciting picture book.